After successfully navigating through the inner aisles of the grocery store for coconut oil, spices, and tin foil, you’ve successfully arrived at the butcher’s counter – finally! It’s all Paleo here; no need to worry about hidden gluten or weird additives. You can pick any cut of meat that looks tasty and fits your budget…right? Right. Any kind of meat will already put you a mile ahead of unpronounceable processed food products, weird soy substitutes for milk and cheese, and additive-laden freezer dinners. But all the different kinds of animal products have different advantages and disadvantages, and it’s useful to understand how they compare to each other, so you can make the best choices about which meats to eat as staple foods. This article will explore several different types of meat: red meat (beef, lamb, goat, bison, etc. 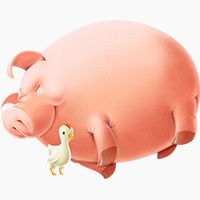 ), poultry (chicken and turkey), pork, and seafood. These types of meat differ significantly in their nutrient quality, and especially in the quality of the fats they contain. Since fats are the foundation of Paleo nutrition, it’s important to know what fats are in your meat, so you can make educated decisions about what to eat and when to supplement with other fats, such as coconut oil. In general, grass-fed ruminant meats (beef, bison, and lamb) are nutritionally superior to poultry and pork, but this doesn’t mean you should never eat chicken again. Focusing mainly on seafood and ruminant meat as a staple source of calories, and eating moderate amounts of poultry and pork alongside plenty of healthy fats like butter or coconut oil will let you maximize both the variety and the healthfulness of your diet. Vegetables and other organ meats like liver aren’t the only places to get your vitamins and minerals – regular muscle meat also has an excellent nutritional profile. Red meat boasts high levels of several micronutrients, including B vitamins, iron, and zinc, as well as smaller levels of other minerals. The iron in red meat is particularly useful because it’s in a form called heme iron, which is more easily absorbed in the body than the non-heme iron in vegetables like spinach. Red meat also aids in the absorption and utilization of Vitamin D – the cholesterol in the fat helps you absorb it from the sun, and red meat also contains a metabolite of Vitamin D called 25(OH)D3, which helps to increase the total level of Vitamin D in the body. Poultry is high in niacin and Vitamin B6, as well as some other minerals like Phosphorous and Selenium, but can’t compete with beef or seafood in nutritional quality. 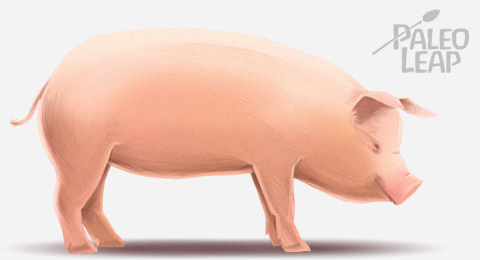 Pork comes much closer, with significant levels of several important B vitamins and minerals. Seafood , of course, also provides an impressive array of micronutrients, from iodine to selenium, and even some Vitamin D. Some kinds of seafood, like mussels, are also excellent source of B Vitamins, iron, and other rarer micronutrients like copper and zinc. Thus, looking only at the micronutrient content of various types of meats, organ meats of any kind are the clear winners, followed by red meat and seafood, then pork, and then poultry. This doesn’t make any kind of meat unhealthy or bad for you, but it’s useful to note – if you have to rely on poultry for a substantial portion of your calories, you might want to take special care to make sure you’re getting enough micronutrients. Animal fat is one of the most delicious and completely guilt-free pleasures of Paleo. Who doesn’t love biting into a perfectly crispy slice of bacon or a succulent piece of steak? But not all fat is created equal: it’s important to know your fats and understand where they come from. Fats are classified into three main types, depending on the molecular structure of the fat: saturated, monounsaturated, and polyunsaturated. Saturated fats are the most demonized by the diet industry, but as Paleo dieters all know by now, they’re nowhere near the villains they’ve been made out to be. Getting plenty of saturated fat is a cornerstone of a healthy diet. Without going into the biology behind saturated and unsaturated fatty acids, the saturated kind are much more stable, and thus do not produce harmful inflammation and oxidative stress like unsaturated fats do. Saturated fats are solid at room temperature: if you’ve ever touched the hard, almost crumbly layer of fat on a beef roast, you’ve felt the texture of true saturated fat. Monounsaturated fats are also very healthy – these are the fats (found most famously in olive oil) that everyone agrees on, from vegans to carnivores. Polyunsaturated fats (PUFAs ), on the other hand, are one of the most hotly debated topics in the Paleo community. PUFAs are necessary for health, but harmful in large amounts – unlike saturated fats, they’re fairly unstable, so in large doses they contribute to inflammation and disease. Many of the chronic diseases of the modern diet and lifestyle are at least related to excess PUFA consumption – as well as being part of naturally occurring animal fats, PUFAs are also a huge component of industrial seed oils and “heart healthy” alternatives to saturated fats like butter and lard. Polyunsaturated fats are also further broken down into two types: Omega 3 and Omega 6 (also referred to as N-3 and N-6). While neither type is beneficial in excess, the ideal diet would contain a much lower ratio of Omega-6 to Omega-3 than most people get today – excess Omega-6 is very strongly correlated with inflammation and overall ill health. Nutritionists advocating conventional wisdom generally support a 4:1 ratio of O-6 to O-3 (the average American gets between 20:1 and 30:1), but truly healthy levels might be even closer to 1:1. All of this is relevant to what type of meat you choose, because different meats contain different ratios of all these kinds of fats. Understanding how to compare different meats in terms of their fat quality is important, but a fairly complicated endeavor. It’s necessary to bear in mind not only the ratio of different types of fats, but also the amount of total fat in the meat. For example, if Meat A has a slightly higher proportion of PUFA but is very lean, while Meat B has a lower proportion of PUFA but is very fatty, you might actually get more total PUFA from a serving of Meat B, because there’s more total fat. Even bearing in mind that this kind of analysis is not simple, it is possible to make some broad generalizations about the fat quality of different meats. In general, the ratio of other fats to PUFA is best in ruminant meat. Beef contains much less total PUFA per 100 grams as pork or chicken does, so in terms of its PUFA profile, beef is a healthier choice as a staple food. If you’re trying to reduce your total PUFA consumption, the diet and lifestyle of the animal also matters: CAFO pork (animals raised in Concentrated Animal Feeding Operations), for example, contains a much higher concentration of PUFA. Chickens fed a high-PUFA diet also had higher levels of PUFA in their meat. This is logical enough, considering that CAFO animals are fed a diet of grains and other products high in PUFA). The higher level of PUFA in the meat is simply a reflection of the higher levels of PUFA in these animals’ diets. When it comes to the ratio of O-6 to O-3 fatty acids within the total PUFA content, beef is also a superior choice. Beef contains an Omega-6 to Omega-3 ratio of approximately 4:1 (although the ratio varies widely depending on the cut and the type of beef), while lamb has 5:2, and pork and chicken are closer to 10:1. This is why chicken fat and beef tallow have such noticeably different textures – if you refrigerate saturated fat like tallow or butter, you’ll get a hard block of fat, but PUFA-rich chicken fat has a consistency closer to applesauce. Again, when discussing nutrition and health, the diet of the animal is also important. For example, scientists at the University of Wyoming found that free-range beef had a significantly lower amount of O-6 PUFA and a higher amount of O-3compared to grain-fed beef (for the free-range beef, the O6:O3 ratio was roughly 3:1, while for the grain-fed, it was closer to 17:1). Several other studies have produced approximately similar number; the precise ratio varies with the breed of cattle and the cut of meat, but free-range beats conventionally raised in every trial. Seafood is also notable for the details of its PUFA content – not because it has a low concentration of total PUFA, but because it has such an excellent ratio of O6:O3. Unlike other meats, which all have more O6 than O3, many types of fish boast an O6:O3 ratio of 0.1 or 0.2:1. This is why fish oil is such a popular supplement among people seeking to re-balance their levels of O3 and O6. In this case, the potential harmful effects of the PUFA are balanced out by the benefits of restoring healthy O6:O3 levels, so the high level of PUFA in fatty fish is actually a health benefit. Thus, in terms of fat quality, ruminant meat and fatty fish are clearly superior to poultry and pork products, with pastured or grass-fed products in every category being far more nutritious than their conventionally produced counterparts. As noted above, though, it’s also important to look at these numbers with an eye to how much total fat the meat contains – chicken, which is much leaner than beef, might not contain as much total PUFA as a serving of chuck roast even though the percentage of PUFA is higher. Cost is one category where chicken categorically wins over almost every other kind of meat. It’s undeniable: poultry is simply cheaper than the alternatives. 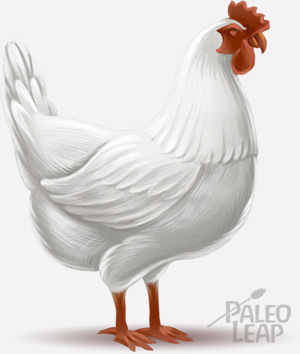 This is one of the reasons why it’s so popular, and why so many people who switch to Paleo end up eating a lot of chicken. To a certain extent, this is inevitable, but there are ways you can reduce the cost of other meats. Buying in bulk is an option for a few people who have the freezer space to store an entire lamb or quarter of a cow, but you could also try striking up a relationship with a local farmer – often you can get grass-fed and pastured meat at farmer’s markets for much less than the same product would cost in a grocery store. Alternately, try ordering meat online from a source like US Wellness Meats or a more local distributor in your area. Look for whatever you can find locally (if you live in Boston, fish will probably be more available from local producers than pork), and be ready to jump on sales and bulk products wherever you can find them. With some clever planning ahead of time and a willingness to be flexible with your menu if you can’t get the exact cut you wanted, it’s possible to put a sizeable dent in your grocery bill. All this information about PUFA and micronutrients can be tough to keep track of, so below is the same information, summarized in one chart that’s easy to print and take to the grocery store, or just use as a reference when planning your meals for the week. Unless otherwise noted, all nutrition data is from the USDA nutrient database. *Because of rounding, and because there are a few other minor types of fatty acids besides SFA, MUFA, and PUFA (naturally occurring trans fat, for example), percentages may not add up to exactly 100%. Before swearing off chicken forever, it’s important to note that all this information is only valuable in perspective, not in a vacuum. While reducing the PUFA content of an already healthy diet is beneficial, the PUFA in chicken or pork is small potatoes compared to the PUFA in seed oils and processed foods. The modern American diet is not so rich in PUFA because everyone is eating too much chicken and not enough beef. A glance through the USDA’s list of foods highest in PUFA shows the top culprits as fast foods, vegetable oils, and nuts – the first meat (sardines) doesn’t even appear until the second page of the list. Eating chicken and pork as staple foods might not be ideal, but it’s a lot better than the standard American diet. These meats are still real foods, and a diet based on them is still a net positive for your health. Furthermore, it’s important to note that if you are limited to less-than-ideal meats as staple food sources, one way to reduce any potential health consequences is to buy only the leanest cuts and supplement with other Paleo fats like grass-fed butter or coconut oil. By also making sure to get plenty of micronutrients from vegetables or other sources, you can go a long way towards improving the quality of your diet. Thus, if you have the option, beef (especially grass-fed beef) and other ruminant meats have some health benefits over poultry and pork products, but if you can only afford to eat chicken, there’s no reason to despair. In fact, there’s even something to be said for eating chicken or pork every now and again, if it adds variety to your diet and makes your meals more enjoyable, or frees up money in your budget for something else important. The best way to maintain a sustainable, healthy diet in the long term is to enjoy a variety of different healthy foods, and chicken can certainly be part of a wholesome, nutritious way of eating.